In 1975, issue 117 of Famous Monsters of Filmland magazine introduced me to William Castle's newest releases, with interesting photos from Bug, which he produced, and Shanks, the last film he directed. 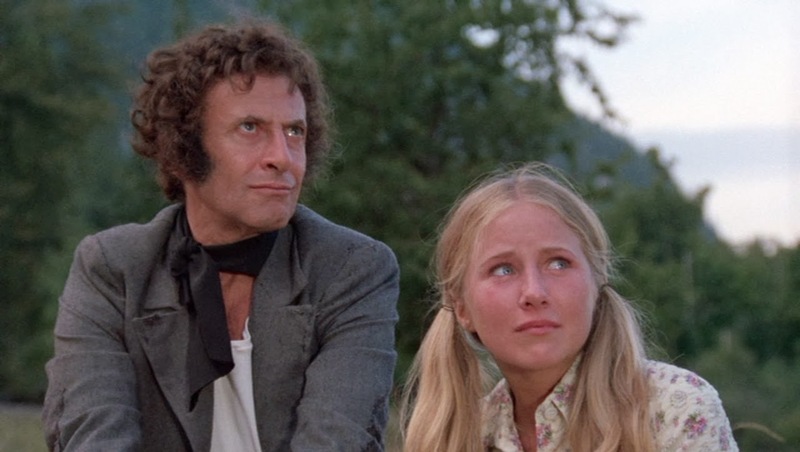 I was too young to see either of them in the cinema, but they both arrived on TV a few years later. I caught Bug a couple of times on TV, having read the original book (The Hephaestus Plague by Thomas Page). 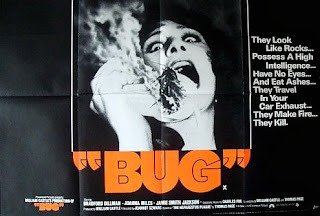 Bug is fairly faithful to the novel, but a scientist attempting to communicate with insects isn't great cinema (certainly not as good as Saul Bass' Phase IV) despite their unique knack of firestarting. The story fits in neatly with two of that decades' obsessions - animal-attacks and disaster movies. But that context which worked far better then has noe been lost, and much of the story takes too many illogical shortcuts, confusing more than it intrigues. 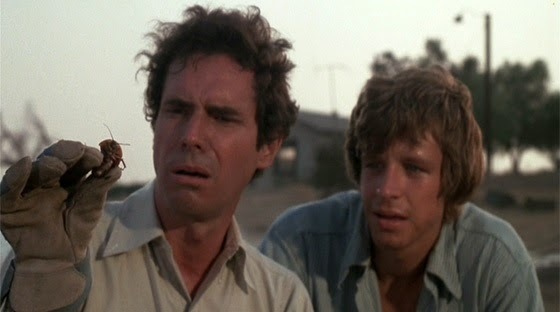 Despite the earnestness of the performance by Bradford Dillman (star of the original Piranha). What's left are the (then) unusual fire stunts and Ken Middleham's insect micro-photography, which also graced Phase IV. Bug is interesting in many ways, but I don't think it 'works' as a whole any more. I only ever glimpsed a little of Shanks on a rare TV showing (early 1980s?) and always perceived it as more fairy tale than horror, especially as it stars the king of mime, Marcel Marceau. The film then disappeared, remaining absent from home video until this year's blu-ray from Olive Films, in the USA. It's much more macabre than I expected, though still retaining an uneasy facade of a children's story. Edward Scissorhands is a useful comparison in terms of tone, because the elements of the story appear simple, childish and comical. But too many moments are too dark for children, despite a prominent young character inviting identification. The puppeteer is our guide to this story. A mute showman who performs puppet plays at children's parties. The scientist, a mysterious old man, invites the puppeteer to his huge remote house, at once reminding us of the corridors of a cutprice version of Cocteau's La Belle et la Bete and the hedges of Edward Scissorhands. After the puppeteer is introduced to the weird reanimation device, he uses it on larger and larger subjects. A series of bizarre accidents giving him corpses to control. The story becomes more surreal and more violent as, out of nowhere, a biker gang arrives and, as in most stories, that means trouble. It's a very small-scale anticipation of the climax Dawn of the Dead! The greatest distraction is the initial 'old man' make-up when the scientist is introduced. It looks like that generic 'Uncle Creepy' Halloween mask. 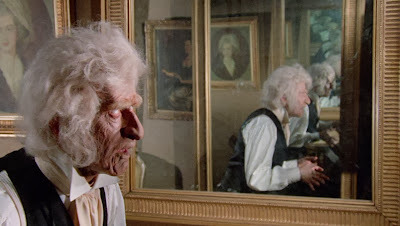 This is presumably a production subterfuge, to have a body double in make-up that matches what Marcel wears later, when he performs as the zombified old man. The less successful of these two make-ups is unfortunately the one we see first (above left) - but it looks far better on Marcel (below). I couldn't spot any splitscreen work, so I presume a body double was used whenever the old man and the puppeteer are seen together. 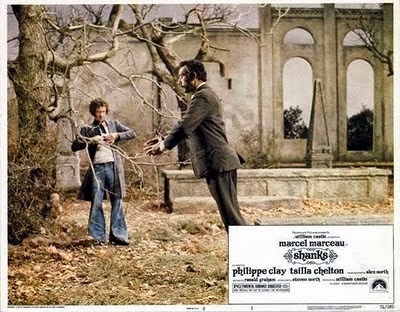 But Marceau is brilliant as a reanimated, manipulated corpse and wonderful to watch - at once horrifying and comical. The core of the film are the zombies - both how they are used in the story, and how entertaining their movements actually are. An odd basis for a film, but quite fascinating. 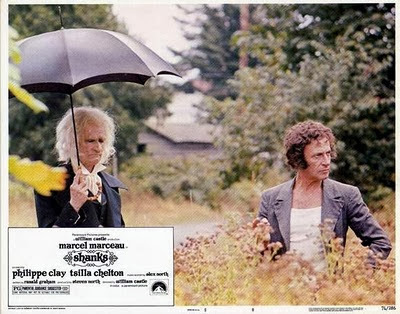 At his most popular, Marceau would appear on TV variety shows, his artistry giving mime a good name, all the time incorporating the best aspects of silent movie acting. It was harder to use his skills in 'talking pictures' though. Famously, he spoke the only dialogue in Mel Brooks' Silent Movie (1976), where he also performs his trademark 'walking against the wind' routine. 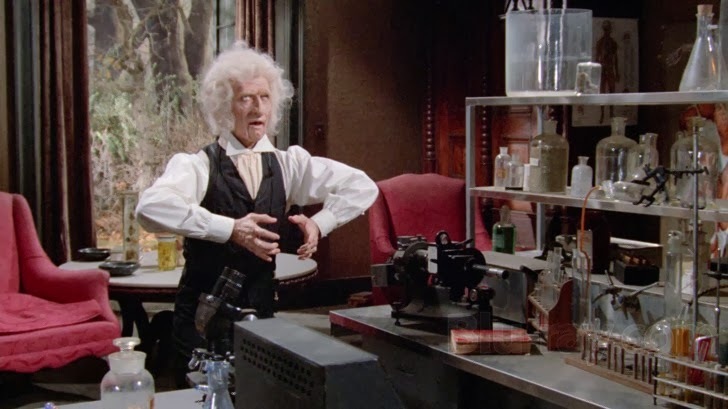 Marceau had previously appeared in Barbarella as eccentric Professor Ping, a rare speaking part. But this is sadly dubbed by another actor in the widely-available US version. I'm hoping that the French version of the audio still exists and uses his actual voice. Though it appears that he and the other European actors, like Claude Dauphin, all appear to be speaking in English. In Shanks, his character is mute, but his magnificent skills as a mime mean he's easily able to carry the story. His acting, his every movement, even as an ordinary, living character, is quite beautiful to watch. So precise. Shanks is hard to categorise but very watchable if you're in the mood for the unusual. If this was Polish art house, it'd be praised as a classic. As a William Castle horror movie, it's practically unknown. 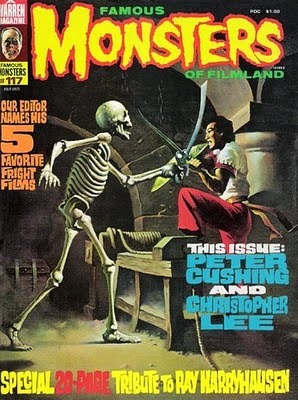 Having now seen most of Castle's earlier chillers, Shanks seems to echo some of his best shocks - for instance, the white-eyed corpse reminded me of The Night Walker. I'm very grateful that Olive Films has released it, thanks for Shanks! 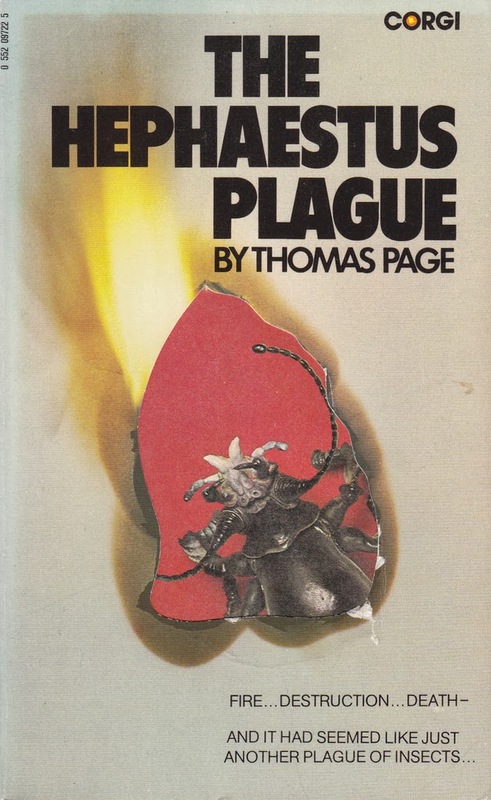 Though I must say that the cover art, based on the original poster, is very off-putting and not very descriptive. 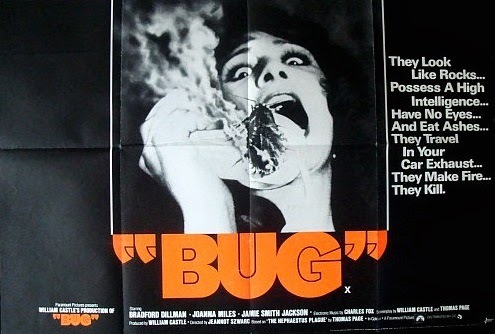 I actually thought "Bug" was a much better film than "Phase IV".